You see, I was having breakfast. A Greek yogurt with strawberry jam to be exact. And it occurred to me that I needed to butcher the Javelina if I was going to have it for dinner. So I marched out to the barn where I met Mike and my pesky brother and got to work. Except I didn’t bother to dress for the occasion. Butchering a pig in flip flops… I think that’s a metaphor for my life. 1. Start with a cool carcass that has been hosed down. See the post on how to skin a pig to get what I mean. This one had been in the refrigerator. 2. Start by removing the tenderloin. 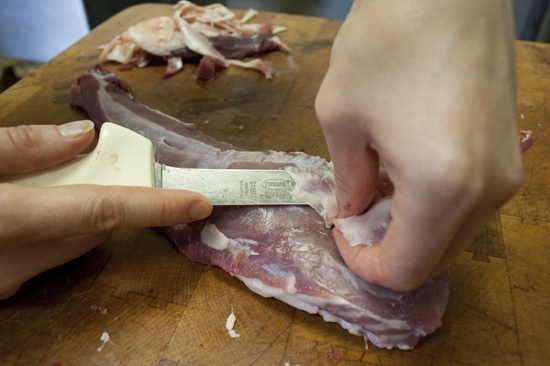 You can practically peel it out but it helps to give yourself a start with a knife. Mine was already a bit nicked from when we field dressed it. That’s why you have to be careful when you field dress. The tenderloin is at stake. 3. 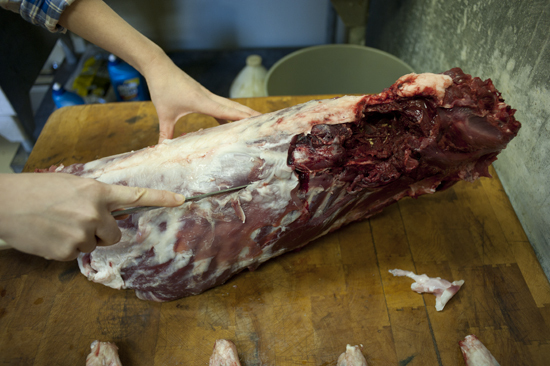 With a boning knife, cut along the seam of the hind leg. It will cut easily. That’s how you know it’s the seam. 4. Flip it over and pop the leg back to reveal the ball joint. Sever it with your knife and the leg should come off easily. 5. Then you will have 2 tenderloins and 1 hind leg. And the dogs of the world will be jealous. That’s what I’m here for. To make the dogs jealous. 6. Repeat step 5 for the other hind leg as well as the front two legs. 7. Then you will have two loins, two hind legs, and two front legs. 8. Then you move on to the backstrap. There are two and they are along the spine. Cut the contour of them and then peel/work them out with the knife. 9. Then do the same to the second. 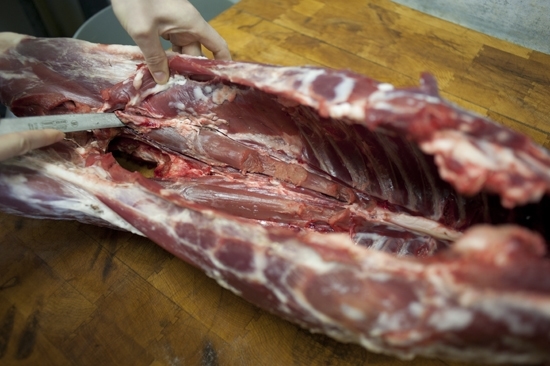 You will have to work with the ridges of the spine a bit and cut deep so you don’t miss any meat. Scrap away gently. 10. 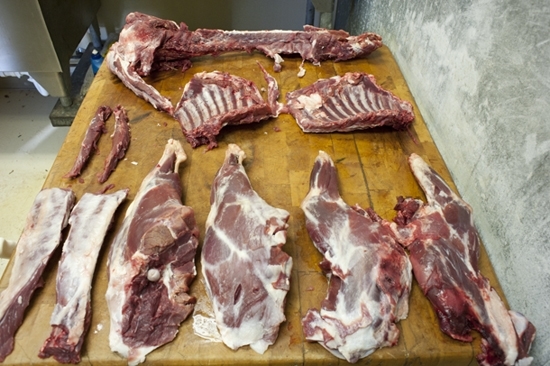 That’s what the carcass will look like at this point. 11. Then come the ribs. 12. They require a hand saw of some sort. And some brawn. 12. You cut the ribs off of the spine on both sides until you get two sets. 13. And also this. Nice carcass, eh? 14. These are all of the parts you will end up with. 10 parts plus the spine. 15. Then you trim. You need to remove any muscle tissue and silver skin that is excess. This will make it easier to cook. 16. The back strap has a lot of silver skin for example. 17. And this is the blood shot from when I shot the Javelina through the lower neck. That is something you’ll want to cut out as well. But keep things trim and a whole as possible. We don’t want to waste. 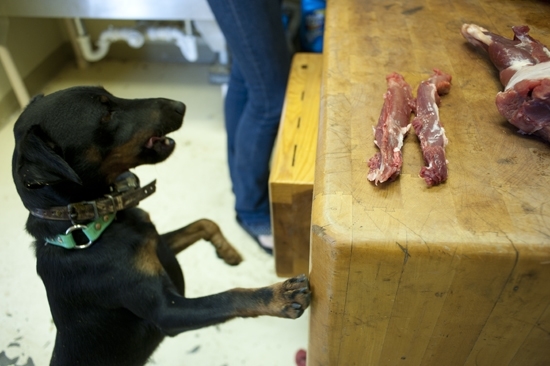 Do you butcher your own food? Or does it gross you out? Photos by Gordon Pellegrini Photography. Hehe… it taps into your inner cave man. I bet you could do it. I really enjoyed these last two posts. 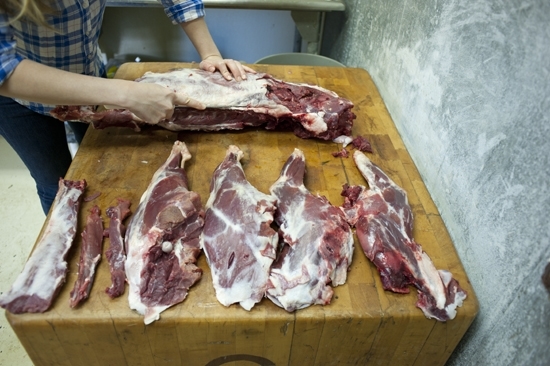 I have never butchered my own meat before, but I am fascinated to try it. Thanks for the great post! Is the skin not suitable for cooking or you just didnt want to fool with it? Well, the silver skin is the shiny thin membrane underneath the fat and hair. There really was very little fat on this Javelina. Normally if there is good fat on a wild animal I leave it on since we need all we can get for the cooking! Otherwise it dries out. 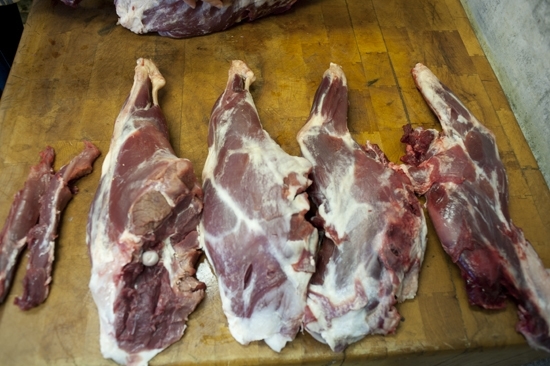 But the back straps have the silver skin and since those are cooked quickly ie. seared in a pan, rather than braised or roasted, it's best to remove the silver skin, since it won't break down and will make the meat chewy. Hope this helps, shout it out if you have any more questions. I guess I was more curious about the hams or shoulders not the backstrap. But if the pig has little fat then I can see not keeping it. I just made some tenderloin "medallions" from a whitetail I shot last weekend and you're absolutely right. The silverskin must be removed. Ive killed some wild pigs in Georgia and they were also skinned and I dont recall them having much fat either. Ive become spoiled by domestic picnic's I find in the store with all that delicious skin and fat layer on them. To the smoker! I braised the two hind legs after marinating it for 48 hours, and smoked the two front legs after marinating it for 48 hours. I also cooked the ribs. But you're going to have to wait for my next book to come out for the recipes : ) Otherwise my publisher will be hunting ME. That's a lot of pig! oh man. I'd LOVE to have an animal to butcher. That makes me want to start heating my cast iron and get ready for action! I talked to my son today who had just finished packing out the elk he got yesterday. Since he shot the elk five miles from camp he had to field dress it, butcher and debone it, then pack it out in fifty pound bags the five miles back. So he basically did that butchering job in a clear cut on the ground surrounded by logs. So glad I was home by the woodstove! Removing the silver skin is a must, but it is just the worst…. You have to get verrrry close to the underneath silver skin and angle the knife up, so as not to take off all the delicious tender meat. It is best done with a good fish fillet knife such as the Rapala knife. 1. Your son is awesome. 2. I'm in Montana right now and there are elk and deer grazing like cattle. It's an amazing sight. 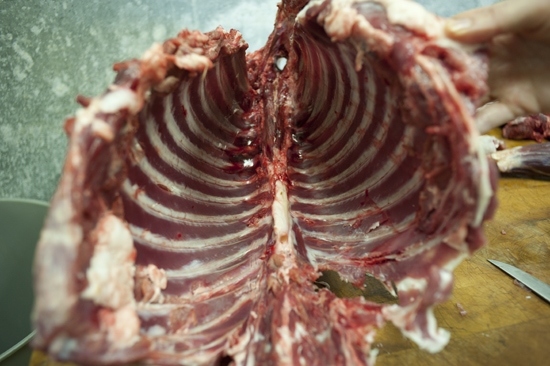 Looking at your photos again I did not know the location of the tenderloin as *inside* the cavity along the spine. (right?) I hope Neal knew that and has the elk tenderloin. I heard elk bugling this morning at 5am. They like to eat their way through the orchards before dawn. Yes that's where the tenderloin is. 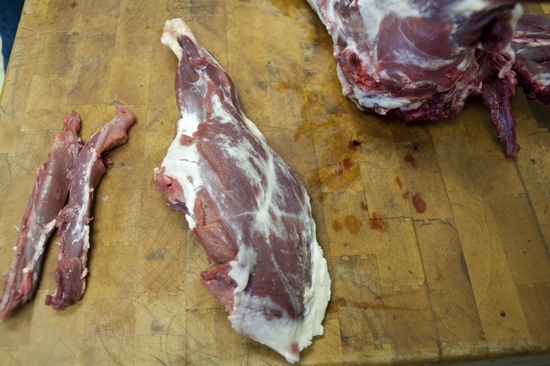 People sometimes call the backstrap "the loin" which can be confusing. That you get from the outside along the spine. 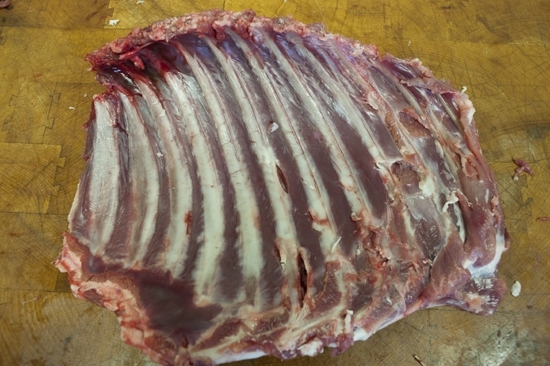 The tenderloin comes from the inside along the spine. Wow — I'm incredibly impressed! And, as a former San Diego girl, the flip flops complete the picture for me. Nice work! Thanks so much! I shot my first javelina yesterday, field dressed and skinned it, guided by a great mentor. Now it’s home and I want to butcher it. I was pretty close in my guessing as I’ve done my share of chickens and roasts and shanks, etc. Love those ball joints! My mentor showed me how to take out the tenderloins and backstraps. 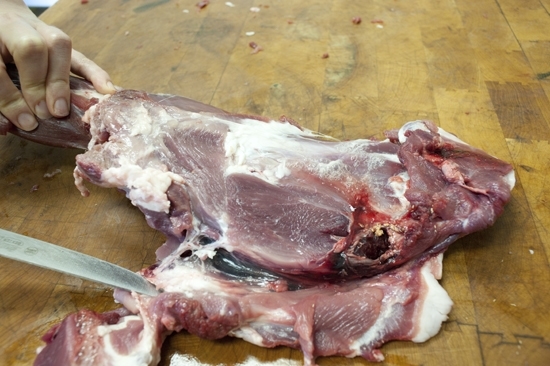 Now to gross out a lot of you… because my mentor was part Shoshone, he suggested I might want to honor the animal in the native way by eating a piece of an organ, so I took the heart, cleared off the pericardium and took a bite, chewed and swallowed. It wasn’t bad at all (but then I like liver and have eaten it raw in Hawaii) and to tell you the truth, I felt better about my first kill. Great job butchering the pig i enjoyed watching how you did it. My husband and I used to raise hogs, lambs, rabbits, goats and calves, 2nd freezer always stocked with good home done meat and game and fish. He has passed away and I did the sausage making, parceling, wrapping and prep…I need to learn how to slaughter. Hoping I can find it somewhere in your great site. Need to get back into raising our own…commercial food sources are too tainted at all levels. Hi Kararae, I don’t have any posts on the slaughtering farm-style, just hunting. But if you have specific requests I can keep them in mind and work on them for you. I wish I had access to your freezer! Mmm. I’ve never shot an animal I didn’t intend to eat and I only had a deer processed once. I butchered my first deer while looking at step by step pictures in a book. I always did it myself after that except once. I didn’t have time to do it myself so I dropped it off at a local “deer processor” (read : “amateur butcher open during hunting season to make some extra cash off the books”) and went back to pick it up a few days later. I had left explicit instructions about how I wanted it butchered. 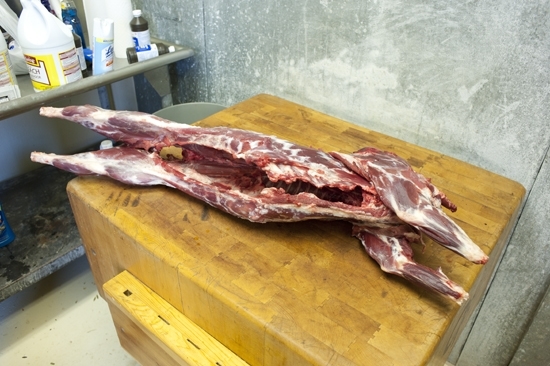 I got back about half the cuts I expected and a lot of ground up meat,might not have even been my deer. All of it had to be cleaned and re-wrapped for freezing. That was the first and only time. One of the books that helped me in the beginning was a tag sale find, THE VENISON BOOK by Audrey Alley Gorton, copyright 1957, published by the Stephen Greene Press, Brattleboro, VT, Library of Congress # 57-13401. It’s a vintage trade paperback with kooky little 1950’s drawings but gives plenty of info on what to do after your deer is down, or as Ms. Gorton says, ” So now it’s venison”. The next chapter is “But it’s still not steak”. There are quite a few copies on Abebooks for about $6-7.00, shipped. Another good one is DRESSING AND COOKING WILD GAME by Theresa Marrone, part of The Hunting and Fishing Library series distributed by Prentiss Hall c. 1987. Lots of step by step pictures. This is a hardcover and there are lots for sale on Abebooks for less than $5.00, shipped. So get some knives, get some books with pictures and read up before you go hunting. Then just do it. At worst you’ll end up with a lot of ugly cuts but hey, you know what? They’ll taste just as good and you’ll only get better. Great advice, especially love to hear about those books, thanks for sharing Rob! And both written by Girls! I hope this does not sound chauvinistic but it is refreshing to see a beautiful woman that is not afraid to jump in and get her hands dirty. I’ve had my daughter read your book and watch a few of your videos and she has changed her mind about it not being “lady like” to hunt. She enrolled herself in a hunter safety class and asked me to “go shopping” with her at the local gun store. I can’t wait to take her out in the field with me. Keep the great recipes coming please! That’s so exciting to hear! Hopefully one of these days she can join us on a Girl Hunter Weekend. We’ve had a lot of young ladies attend and it’s been wonderful. 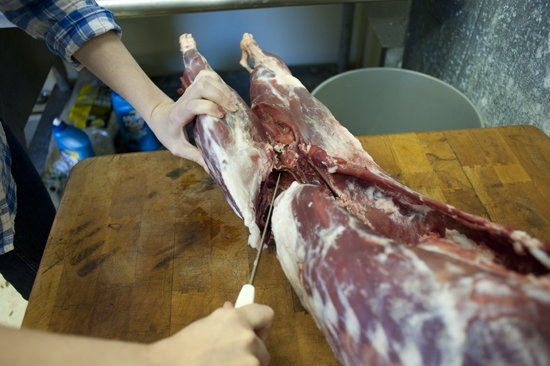 Thanks, I getting ready to butcher a hog and am to chrap to pay butcher( plus I love to butcher my deer).